fully developed garden takes years of dedication and hard work before it matures into its full glory, and even then it will need constant tending, honing, shaping and weeding. The same can be said for the career of a visual artist, who may need years of work and study, and perhaps even formal education, to be able to manipulate the rules of art they have learned in order to create works that speak fully to their individual talents and experience of life. 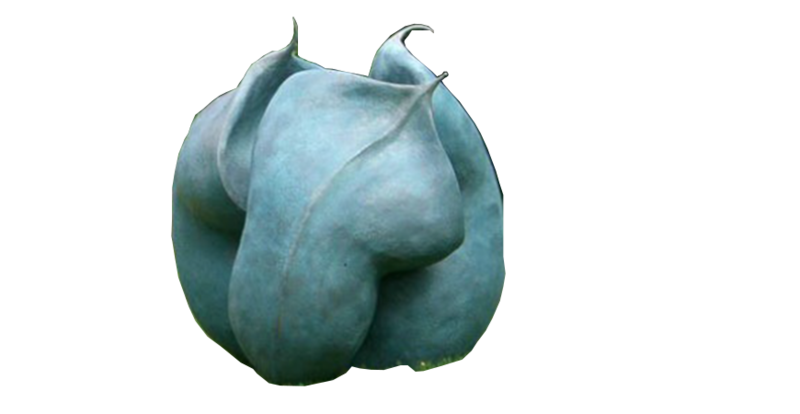 Anne Curry is an artist whose recent work –– sculptures in the form of oversize flower buds –– seems to quite literally be the culmination of years of tending and developing her craft like a garden, giving bloom to a focused interest in the young and the aged, the innocent and the cultured. My work at Christie’s in New York affords me the opportunity to see in person a great variety of art across diverse genres, a daily experience that is supplemented by having access to in-depth scholarly catalogues about art from our various galleries around the world. But because there is no place to view Curry’s work in person in New York, I have only been able to become familiar with her through her own comprehensive website, which is the source of any fact I offer here. As I began to explore her body of work, I felt like I was absorbing the details of her personal life experience. 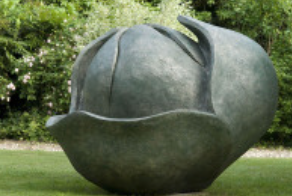 I was immediately attracted to her realistic, highly detailed and life-size portrait sculpture busts, and her simple, almost abstract, and larger than life garden sculptures of flower buds (such as the photograph of Curry's Helleborus Niger Seed Pod (Resin - H: 1.40m, W: 1.40m, L: 1.40m) at the opening of this article, above). While her realistic sculpture busts and quasi abstract flower buds seem to be polar opposites in style, there is an obvious femininity and sensitivity throughout her work that make for a comprehensive and holistic oeuvre. For her portrait sculptures, Curry looked to the Egyptian art she studied at Oxford in the 1960s. 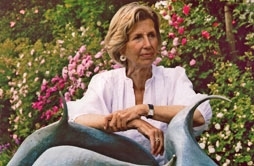 In the 1970s she focused on the family she had begun, while at the same time cultivating a magnificent garden. Her role as a mother, fed by the energy of her garden, served as an inspiration for many of her chosen artistic subjects over the years and eventually led to her interest in rendering expressions of youth –– in both human beings and flowers –– in stone, bronze and terracotta. But Curry is also a painter. In 1989, in an exhibition called “Le Potager” in Paris, she recorded the development of her vegetable garden in paint. The same year as her exhibition of paintings in Paris, Curry embraced the discipline of sculpture, becoming renowned for her portrait busts in bronze and terracotta. The human face proved to be the perfect medium through which to express her growing interest in the subjects of youth and maturity. Curry became so accomplished and well known for her portrait busts that she was commissioned to sculpt portraits of important British politicians, including the former Prime Minister, John Major. Curry mentions on her website that she sculpts from life, writing that "empathy with the sitter is essential to convey personality beyond mere likeness. If sculpting a portrait starts as 'a dance with a stranger,' it must end as a conversation between close friends." In the Prime Minister's portrait, Curry has made the ears, the nose, the indent in the upper lip, and the creases of the mouth all highly pronounced, increasing the observer’s sense of knowing something about the sitter. Working directly from life, a unique process in the discipline of sculpture, is evident in all of the likenesses Curry renders. Her pronounced lines, which show age, also indicate movement –– you can almost see in her portrait sculptures how a sitter's facial features would have moved to present a wistful look or a furrowed brow, for instance. In the case of former Prime Minister John Major, one can see how the corners of his mouth have turned into a smile. In fact, the faces of Curry’s subjects look as though they are in the process of moving from one expression to the next, and we, as observers, are almost watching those changing expressions as they happen. Thus the artist’s ‘dance with a stranger’ becomes the art observer’s conversation with a friend. In direct contrast to Prime Minister Major, a a middle-aged politician who witnessed firsthand the trials and tribulations of the world, Curry also sculpts subdued portraits of children, an endeavor inspired, as she has written, by the presence of her own large family. In her sculptures of older subjects, facial lines indicate expression and personality. Yet in her sculptures of children, who of course do not yet have wrinkles, but are young, fresh to the world, and unaffected by the travails of life, the faces of her subjects appear almost stoic. The children’s likenesses –– their individual puffy cheeks, noses, eye shapes, and hairstyles –– are all convincingly and perfectly captured, but without wrinkles and age lines to indicate movement the children seem, curiously, almost expressionless. Terracotta is a unique medium in sculpting today, but it was quite popular during the Italian Renaissance. 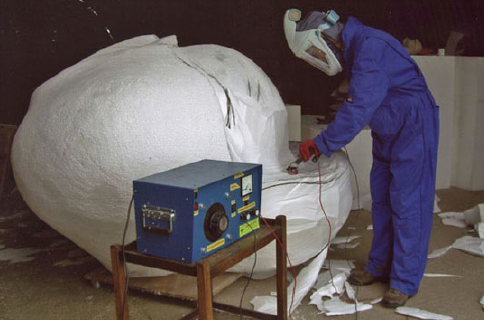 The material was used in architecture, both for roofs and decoration, as well as for figurative sculpture. This fact would not have been lost on Curry, who, in addition to studying Egyptology at Oxford, also received a degree in art history from the University of Sorbonne. Although a different genre of art entirely, Curry also looks to Ancient Egyptian sculpture when creating her large scale resin garden sculpture flower buds. It is this work, her most recent, that pulls together her interests in the young and the old, the new and the cultivated. 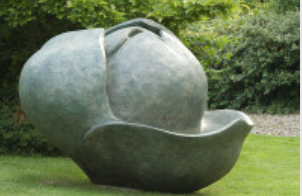 Given that Curry has worked for years around plants, cultivating a wonderful garden out of bare fields, it seems only natural that, as an artist, she would eventually create garden sculpture, drawn to manifesting oversized flower buds, which are rendered in simple, organic shapes. In their simplicity, these cast resin or bronze buds evoke the “material, line, volume, and form” that interested her in Ancient Egyptian sculpture. It seems appropriate that Curry’s sculpted flower buds, which exemplify the ripe beginning of life, would possess the same “controlled movement,” “internal energy,” and, yes, even the sensitivity apparent in her portraits of children. 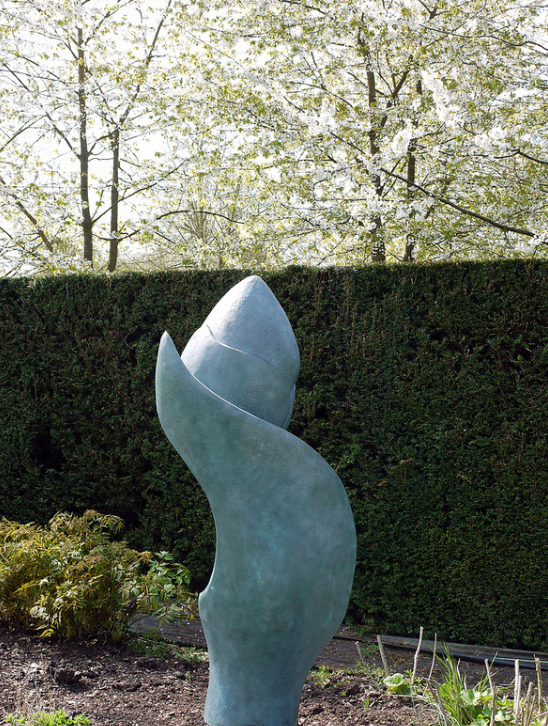 These abstract, organic forms can be described as inherently feminine –– graceful and gentle, their rounded curves approaching a kind of unfurling female sensuality and sexuality. However the process of creating these monumental buds is most certainly not an inherently “feminine” process. At Storm King, not only are the sculptures gargantuan, but the landscape itself is impressively huge and expansive, natural, uncultivated and un-manipulated, a complete 180 degree turn from Curry’s sculptures of oversize flower buds placed within cozier spaces in a perfectly manicured garden. If one compares Curry’s expressive portraits of older people, her subdued portraits of children and her highly simplistic nascent flower buds, it is apparent that Curry sees youth as simple and innocent, but it is a simplicity and innocence that over time will naturally give way to age, become expressive and cultivated, like a garden fulfilling its promise. Gardens often take decades to mature...like people. The lines of demarcation between flower beds and plants blur, change and shift, their maturing shapes giving rise to constant movement and changing expressions. All very much like human facial expressions and moods, and all very much like the expressions, moods and movement within Curry’s portrait busts in stone and terracotta, and within her over-sized flower buds. Anne Curry’s maturity as an artist has blossomed in tandem with her garden. In her work there is a profound respect for beginnings and endings - for the almost expressionless simplicity of youth and the expressive fullness and richness of age. Placed within the context of a cultivated garden, her simple buds become perfect expressions of both innocence and age. But there is another element to these stone works of art placed within a natural landscape. If dancing with a stranger becomes a conversation between friends, as expressed in the relationship between portrait artist Anne Curry and her sitter, she has perhaps also created another kind conversation - that between living plants and flowers and her renderings of them in stone. Even though I have not had the pleasure of being in the presence of one of her over-sized buds, or have not yet been able to see them placed with a garden context, I feel I can almost hear them talking to one another. Caroline Rush earned her bachelor's degree in art history from Rutgers University and her master's degree from the Savannah College of Art and Design, after which she worked for two years as a curator for the SCAD Museum of Art, the Savannah College of Art and Design's art museum. She relocated to Brooklyn with the goal of working in the New York art world – and has worked in business development in the executive offices at Christie's international Auction House in New York for four years. In addition to working for Christie's, Caroline raises money for the Museum of the City of New York as a Young Member, writes freelance for online arts journals, and loves to travel.